THE FLOWER SHOP that is more than a flower shop…. 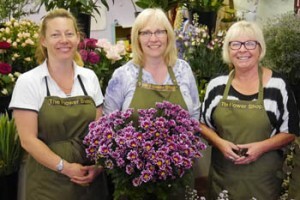 The owner, Doreen (on right) and her staff Fiona and Carol are more than happy to help you select flowers for all the important occasions in your life….or ‘just because’. You get real personal service here because all three of them really enjoy what they do and will happily help you choose something you love at an affordable price. However, if you are looking for an unusual or quirky gift, then this is the place to come…..we enjoy sourcing stock that is out of the ordinary and that you don’t see everywhere else. You are always welcome to come in to browse, to buy or just to smell the roses! A sister web site to VisitNairn.com and offers free listings to all local businesses.